Patara is mentioned only once in the New Testament. When Paul and his companions sailed from Miletus on their way to Syria (Caesarea), they made stops at Cos, Rhodes, and Patara in the Roman province of Lycia in Asia Minor (Acts 27:5). Patara is known as Gelemis (in Turkey) today, but the sign on the main highway from Fethiye to Kas points to the ancient site of Patara. Patara served as a way station for sea travelers, and Paul changed ships here to Phoenicia at the end of his third journey in AD 57 (Acts 21:1). (Biblical Turkey, 91). 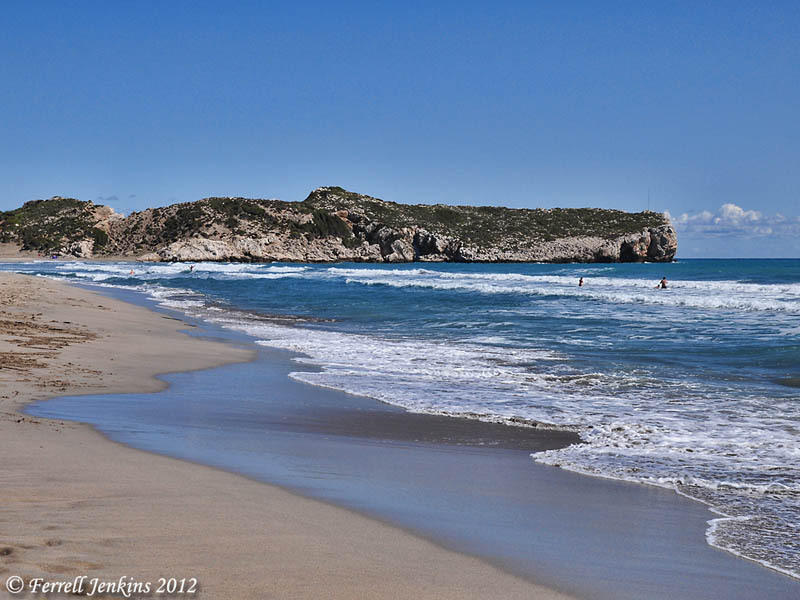 The beach at Patara is a popular leisure place for locals as well as visitors to the area. For this photo we drove the narrow road from the main highway through the ruins of the city to the water. Beach on the Mediterranean Sea at Patara, Turkey. Photo by Ferrell Jenkins. Patara already had a long history before Paul stopped there. Tradition has it that it was founded by Patarus, a son of Apollo. Persians used the port during the Persian Wars. The city later came under the control of Alexander the Great, the Ptolemies, and the Seleucids in succession before being given freedom by the Romans in 167 B.C. In 43 B.C. the city became part of the province of Lycia (Biblical Turkey, 90-91). 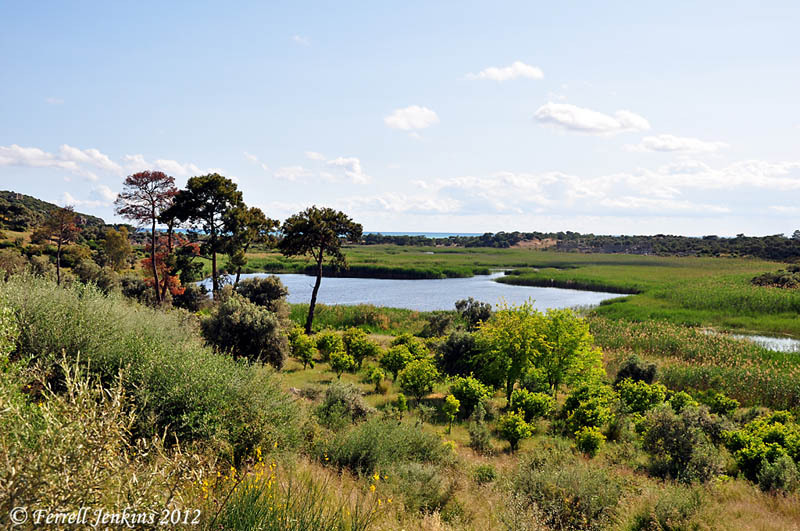 Our next photo shows the site of the silted up harbor of Patara. In the distance you will see a narrow sliver of blue between the trees and the sky. That is the Mediterranean Sea. Entrance to the harbor from the Sea is blocked. Ruins of granaries built in the days of Hadrian (A.D. 117-138) are visible on the west side of the harbor. Click on the photo for a larger image. Silted up harbor. The Mediterranean is visible on the horizon. Photo by Ferrell Jenkins. Our last photo shows the theater which was built in the Hellenistic period, but was rebuilt in the time of the Roman Emperor Tiberias (A.D. 14-37). It seated more than 6,000 people. Theater at Patara. Photo by Ferrell Jenkins. Use the search box for posts about some of the other places mentioned in Acts 21: Rhodes, Cyprus, Tyre, Ptolemais, and Caesarea. 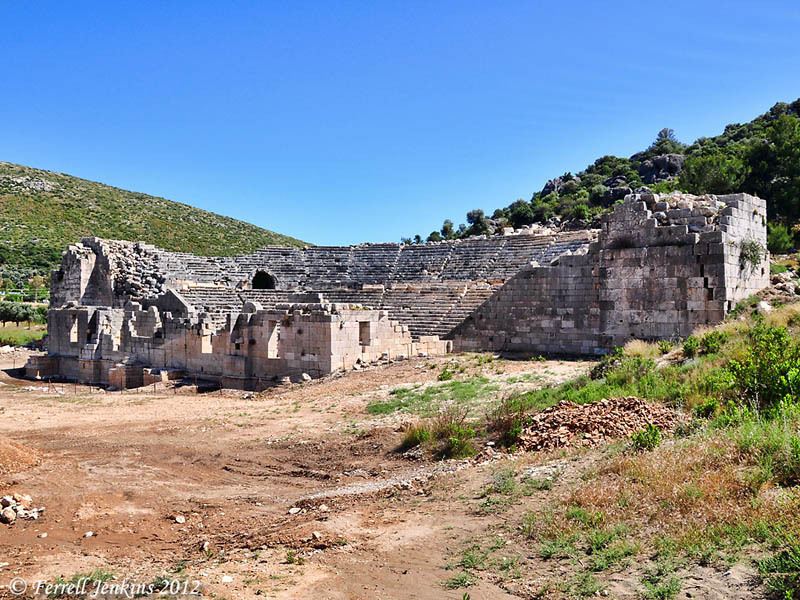 This entry was posted in Bible Places, Bible Study, Book of Acts, New Testament, Photography, Travel, Turkey and tagged Apostle Paul, Roman Empire. Bookmark the permalink. This post is really very useful. As we are in to visiting industry that’s why I would like to talk about our company’s details. Eticketstofly provides cost-effective air visits to all considerable African-american locations from different locations of U. s. Kingdom at most cost-effective available offers in the whole journey industry.Patara already had a lengthy record before John ceased there. Custom has it that it was established by Patarus, a son of Apollo. Napoleons used the slot during the Nearby Conflicts.